Are you looking for local focused and personalized yoga classes? Harbor Physical Therapy offers Yoga and Chair Yoga weekly for only $15. All levels are welcome! Call 443-524-0442 to reserve your spot! If you have been suffering from pain in the front of your knee while running, you may be suffering from patellofemoral pain syndrome, also known as runner’s knee. Multiple factors including muscle weakness, tightness, and imbalances can contribute to increased stress on the knee cap and the structures underneath it. Patellofemoral symptoms increase the more that you run. The best way to decrease symptoms is to get a thorough evaluation by a physical therapist to determine the most appropriate exercises for you. Listed below are several strengthening exercises that target the muscles in your hip and knee that are commonly provided to patients with knee pain. Straight Leg Raise– Squeeze your quads in the front of your thigh to straighten your knee and lift your leg to the level of your opposite thigh. Clams– While on your side with your knees bent, lift your knee up. Do not let your hips roll forwards or backwards. 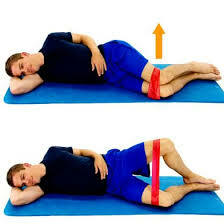 Side-lying Hip Abduction– While on your side, squeeze your quads to straighten your knee. Lift your leg up without letting your hips roll forwards or backwards. Bridges– While on your back, lift your hips up to the ceiling while squeezing your core and glutes. If your symptoms still persist after performing these exercises, please call Harbor Physical Therapy to schedule an appointment.